I knew when the book came in…had just heard a review of the independent film…and wanted the book on our shelves. Now I have to wait to get my copy because it is always out. AND…I watched the movie BEFORE I read the book. S’kay, though. I am going to highly recommend the book and the movie. Yes, it’s cancer, it’s the ‘outsiders’ at school, it’s homemade film-making (the characters do this, not the movie makers), it’s weird but loving parents. So many nuances make this a worthy film to watch. Read the book? I think you should. The movie is hilarious in spots with an underlying emotionality that blew me away at the end of story. Meet Greg, Earl and Rachael. 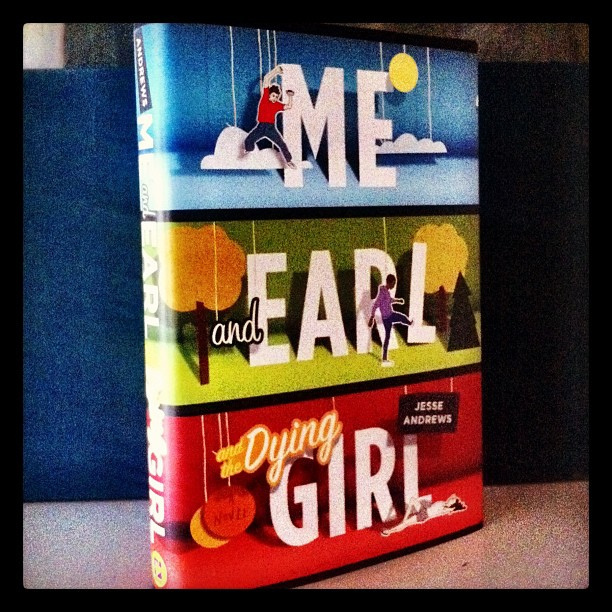 Yes, they are the Me and Earl and the Dying Girl of book fame. Now available at your local library. PostScript: Loved the book, too. 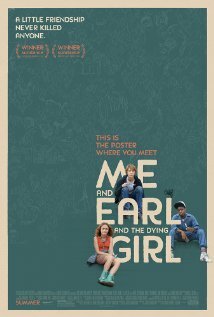 Running dialogue of Greg’s mind, his movie camera look at his world all make for hearing the voices of characters and feeling the angst, confusion and unknown ‘me-ness’ of Greg, Earl, Rachel, Madison, the entire menu of book people. The book is significantly different in surface ways but still carries as does the movie, the intention of discovery of self and how much we will NEVER know about another person.